Syrian Activist's Offer Of Talks With Assad Draws Mixed Response : The Two-Way Activist Moaz al Khatib said he was open to talks with representatives of the Syrian regime under certain conditions. Criticism from within Khatib's own ranks was swift, but so was support form Syrians both inside and out of the country. 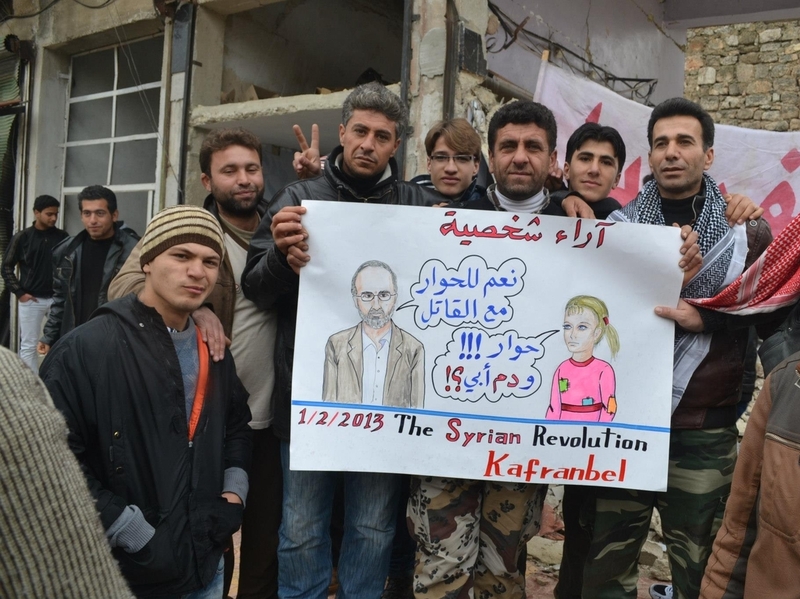 Activists in the town of Saraqib, Syria, hold a poster that reads, "Sheikh Moaz al Khatib represents me." Moaz al-Khatib sent waves through the Syrian activist community this week when he announced via Facebook that he was open to talks with representatives of Syrian President Bashar Assad's regime on two conditions: that political prisoners, thought to number in the tens of thousands, be released; and exiled Syrians be able to renew their passports at embassies abroad. This is the first time that one of the main Syrian opposition groups has agreed to talk to the Assad government or the regime's allies, namely Iran and Russia. NPR's Kelly McEvers reports that "up until now, the main Syrian opposition groups ... contended the regime simply has too much blood on its hands, that Syrian President Bashar al-Assad must step down before any talks can start." Criticism from within Khatib's own ranks was swift, but so was support form Syrians both inside and out of the country. 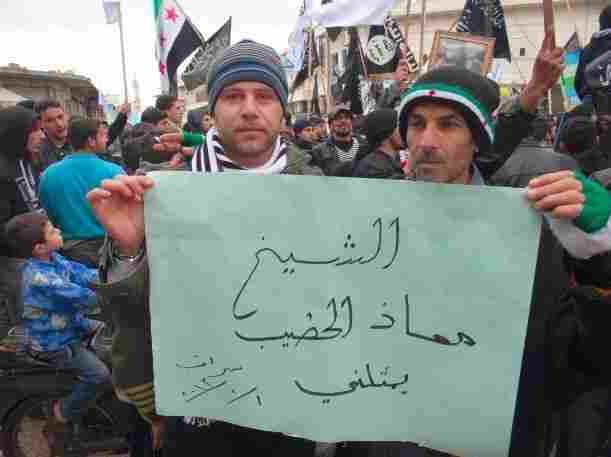 Activists in the town of Saraqib, near Idlib, held a poster that reads "Sheikh Moaz al Khatib represents me." Many syrians are tired. The uprising that started as a protest movement two years ago but has since turned into a civil war has killed more than 60,000 people and left millions homeless. In this poster seen in Kafr Nabl, Syria, a likeness of Syrian activist Moaz al-Khatib says: "Yes, Dialogue with Killers," and a young girl asks: "But what about the blood of my father?" "Any strategy to alleviate the suffering of our people is legitimate and even a duty," Majid al-Shoufi says in a Facebook comment on Khatib's original post. Shoufi adds: "let [Assad] go, and God and history will take care of him... let us live in peace." But as NPR's McEvers reports, while some Syrians welcome the talks, for others "it's unthinkable to negotiate with a regime responsible for killing tens of thousands of people." In this poster seen in Kafr Nabl, also near Idlib, a likeness of Khatib says: "Yes, Dialogue with Killers," and a young girl asks: "But what about the blood of my father?" "SOC [the Syrian Opposition Coalition] leader Moaz AlKhatib violated the SOC charter with his announcement that he is willing to engage in dialog with the regime." The coalition's founding document, the Doha Agreement, states that all coalition members agree "not to engage in dialogue or negotiations with the existing regime." But as Khatib said, a quote one activist later drafted on a poster: "We're not negotiating for the regime to stay, we're negotiating for its departure."